See that little green box on the right? That's the Love Food Hate Waste logo - and it's there because I absolutely hate any kind of food waste in my kitchen. If there is anything left in a saucepan or frying pan after everyone has eaten, I save it and try and use it the next day. If I see a wilting head of broccoli in the fridge going floppy I make something with it that day, to get it used up. According to Love Food Hate Waste, we throw away 8.3m tonnes of food each year in the UK. And that's not all. Chucking all this food away costs the average family with children £50 a week - or £680 a year. When I was a student at uni I wasn't so clued up on cooking (I had to ask my housemate how to heat up a tin of baked beans! ), and survived mostly on tinned food and takeaways, which now I look back, was a really expensive - and not incredibly healthy - way to eat. So I thought I would put together three (and there are so many more but I had to restrain myself) of my favourite leftover food solutions. I think it's true that sometimes a meal made with leftovers can be better than the meal the leftovers came from - or at least that's what I think. Give these dishes a go the next time you open the fridge and stare at a bowl of leftover cooked peas or a tupperware container filled with sticky, cooked pasta. I am terrible at pasta portioning. I grab a huge handful of the stuff, forgetting that it swells when it's cooked and I almost always end up with some pasta left over that I can't fit into already overflowing bowls of bolognese. If this ever happens to you, don't bin it! Make a spaghetti omelette the next day. Trust me, it's gorgeous. Just put your leftover spaghetti or pasta in a container (you can use it if it's covered in sauce, or plain) and put it in the fridge. The next day, beat 3-4 eggs in a bowl, drop in the cold, cooked pasta and leave it there. Grate some Parmesan if you have it into the eggy pasta mixture, add a pinch of salt and pour into a hot, oiled non-stick frying pan. Cook the omelette until done (give it a blast under the grill if you like, to finish the top) and tuck in. The strands of soft, starchy spaghetti are chewy and filling amongst all that egg and cheese. I actually cook a little bit more pasta than I need now, so I can have this for lunch the next day! True! If I have any curry left over or any cooked, chopped vegetables I make samosas. 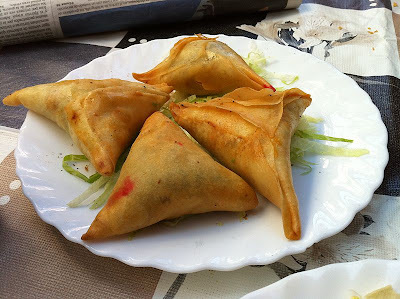 You just cut strips of filo pastry, brush them with melted butter, push about a teaspoonful of your curried veg onto the top of it, and roll up into a triangle shape. They're traditionally fried but I bake mine in the oven for 20 minutes or so - until the pastry is crisp and the insides are hot. Perfect for lunchboxes, picnics, curry nights or for eating straight from the fridge while the door is still open. I also make pasties quite regularly now, too. I cut a circle (using a saucer as my guide) out of shortcrust pastry - usually bought, not home made. Then I dab spoonfuls of anything I have left over - beef and ale stew, curry, chilli con carne - over one side and then fold it over to make a semi-circle. Press around with the prongs of a fork to seal it, brush with beaten egg and bake for around 30 minutes until the pastry is cooked and the filling is piping hot. Aside from saving you money, all that rolling and cutting is actually quite therapeutic! There isn't much that can't be heated up with some stock and made into a soup. Leftover veg make excellent soups - from carrots that are a little bendy to floppy broccoli heads - even frozen peas can be added to make up some bulk. You can also tip in some small pasta shapes and rice or you could drop in nests of noodles and make a Chinese noodle soup. Or for a minestrone-style soup, tip in some cooked beans and broken spaghetti as well. All excellent stuff and guaranteed to save you money. Oh and don't throw away the bones of a roast chicken or duck after you've eaten it - use them to make a natural, tasty stock for the basis of a soup or risotto. You'll be surprised at how different it tastes from a stock cube. Bubble and Squeak (leftover mashed potato, a diced onion and some green cabbage fried together until slightly crisp). One of the leftover meals of my childhood that I always love to eat is something we would eat on a Monday night. We'd feast on slices of cold chicken or turkey leftover from the Sunday roast with chips and pickle. I still make it for Boxing Day dinner for my family now! What are your favourite recipes for using up leftovers? Fried rice as I am incapable of measuring the damn stuff. Spanish Omlette, as you can put anything in it and Risotto for the same reason. Mind you Risotto uses rice which takes me back to the start, a vicious food circle no less. To be honest anything we haven't eaten the night before, gets popped into a tupperwear box and taken to work for lunch the following day! It does mean that for 24 hours I eat only lasagna etc!